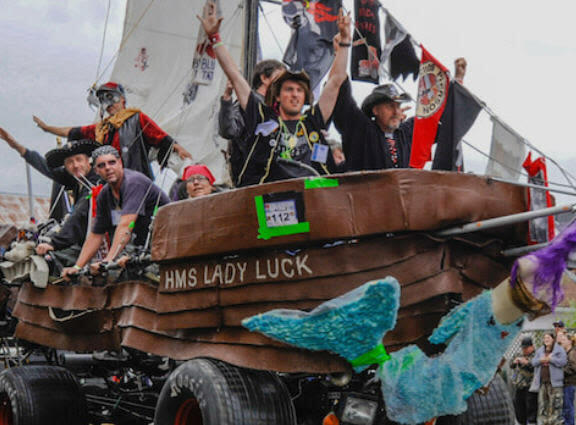 The Kinetic Grand Championship, the world's original art triathlon, runs every Memorial Weekend, starting in Arcata and ending on Main Street in Ferndale three days and 42 miles later. Forty to fifty entries are typical, with anywhere from one to ten people on each contraption, and there are usually several survivors by the end. Just kidding. But they really do ride pedal-powered sculptures over land, sand, mud and open water, while wearing silly costumes and singing silly songs. Sure, many people would do this for enough money -- witness television. But there is no money. And the trophies are homemade works of art by local sculptors. The Great and Wonderfully Marvelous Kinetic Grand Championship will begin at NOON with the whistle on Arcata Plaza. Kinetinauts lap the plaza three times and spin-out of town on the bottoms road to Manila, where they cross the dunes and go down the strand to Dead Man's Drop, a steep and challenging sand hill where out of control vegetation threatens to eat machines and the man eating mosquitoes happily feast on the remainder. Survivors cross the bridge to Eureka where a huge welcoming committee cheers them on at the end of day one. The Bay Crossing where vehicles and kinetinauts test their mettle against wave, tide and man eating clams. View from Halverson Park along the waterfront at the foot of L Street or the Boardwalk in Old Town. All this will be followed by a romp to Table Bluff Hill and a well earned night's rest at a campground along the Eel River. They cross the Eel River, amuse the cows on Ferndale bottoms roads and enter Main Street Ferndale covered in mud, with a well earned sense of accomplishment and a giant smile. The awards Ceremony is held after a supper at a Ferndale venue. Thousands of people flock to Ferndale for the annual finish line which is the intersection of Main and Brown Streets. 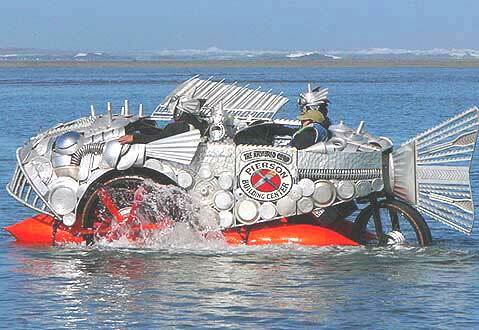 The Kinetic Grand Championship was initiated by metal sculptor Hobart Brown in Ferndale, Humboldt County, on the North Coast of California. All Hobart did, at first, was change his son's tricycle into a goofy five-wheeled contraption. Ashamed of his midnight fantasies, he hid the child's toy. Later at a party Ms. Marty McGonagh (sp?) rode the Pentacycle around inside the gallery. At that moment, bronze sculptor Jack Mays pronounced himself "not impressed," and a friendly challenge to race "kinetic sculptures" (Jack's words) down Main Street, Ferndale on Mother's Day.